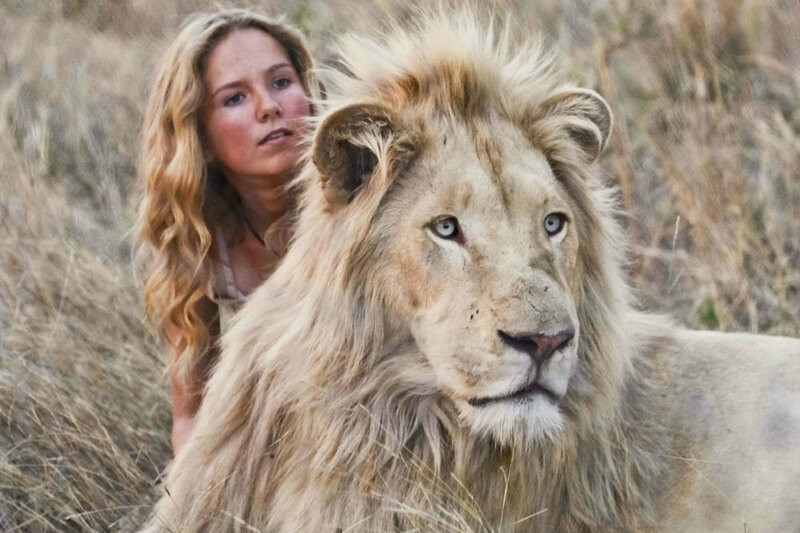 A kind of cross between Richard Linklater’s Boyhood and Wild Kingdom, Mia and the White Lion is a coming-of-age story with big cats that was filmed over multiple years, allowing the child actors (and the starring lion) to age before us on screen while forming genuine physical and emotional bonds uniquely leveraged by the filmmakers. A scene from Mia and the White Lion. When we first meet Mia and her brother Mick, they have just relocated to South Africa, where Mia and Mick’s South African father and French mother (Mélanie Laurent) are preparing to run a lion farm that serves alternately as a B&B, a research lab and, unknown to the children, something more sinister that propels the film’s climax. With her posh accent and forthright nature, Mia (Daniah De Villiers) doesn’t fit in with her new classmates and spends time Skyping with friends back in London. Soon though, Mia’s dad John (Langley Kirkwood) introduces a rare, orphaned white lion cub to the household. Impossibly cute, clumsy and very needy, the cub dubbed Charlie immediately connects with Mick (Ryan Mac Lennan). Self-absorbed Mia will take some time, but connect she and Charlie do. Skype takes a backseat to playful romps in the yard. What follows is a slow growth progression where kiddo and cub fumble, stumble and learn to be independent while leaning on each other. It’s fascinating to watch Mia, Mick and Charlie grow up; unmistakably the same beings but older and stridently more poised as the years go by. It’s also rousing to watch the cast horseplay with regal, blue-eyed Charlie and those gargantuan white paws; interactions that are real and were overseen by South African lion expert/wrangler Kevin Richardson. The supporting cast includes zebras, ostriches, hippos, elephants and a scene-stealing meerkat. Happiness screeches to a halt when Mia discovers that her father’s plans for his lions aren’t all sweetness and light. At this point the film takes a much darker turn as Mia and Charlie run away seeking refuge while previously sullen Mick steps up to run interference between John and Mia. Directed over three years by Gilles de Maistre and based on a script by his wife, Prune de Maistre and William Davies — and inspired by child/animal relationships de Maistre witnessed while filming a documentary — Mia and the White Lion has ethical points to make, as well as some pointed observations on the commodification of the wild. There is no comment on the morality of “employing” a real lion to “act” in a multi-year film project involving children, lights and cameras. Still, the film brings great heart while underscoring ties between family, friends and, crucially, between humans and the wider environmental world in a way likely to resonate with tweens and teens in North America as it has already successfully done internationally. Mia and the White Lion. Directed by Gilles de Maistre. Starring Daniah De Villiers, Mélanie Laurent, Langley Kirkwood, and Ryan Mac Lennan. Opens wide April 12.